Ardell Ultra Lashes Style #207 are short in length, yet add a perfectly subtle amount of fullness to your natural lashes. The included bottom lashes help complete an all around look, outlining your entire eye with fluttery lashes! Ideal for occasions: Party, Prom, Wedding, Night out, Runway, Fashion show, Photography. 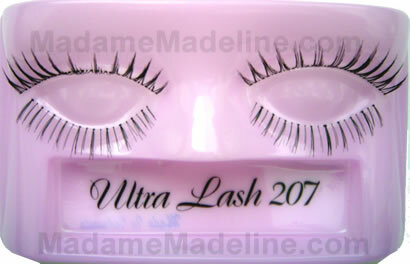 gorgeous, this picture doesnt do these lashes justice at all! they make your eyes look wider and doll like and best of all it looks completely natural! #207 are beautiful. They are perfected sized and look very natural. I order them all the time now.